The V-1092 permits adjusting speaker volume from a convenient wall mounted location. 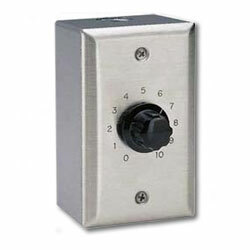 The volume control features a stainless steel plate with embossed numbers and fits a single gang electrical wall box. The wall mount volume control controls volume of up to 150 one-way self-amplified speakers.